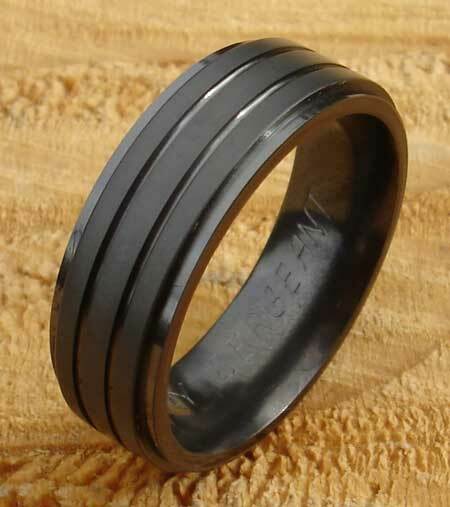 Men's Modern Wedding Ring In Black : LOVE2HAVE in the UK! A very modern men's wedding ring with simple but effective styling made from zirconium. 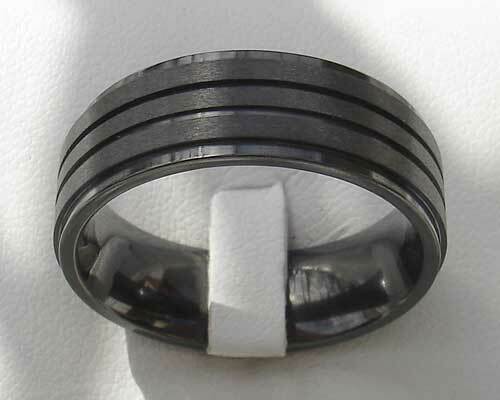 The ring features a raised central section that has been machine cut with two perfectly parallel grooves that run around the entire outer rail. The one pictured here is in a glossy satin finish, but polished is also available too on request. It makes a lovely wedding ring with its comfort shaped inner and is available in widths ranging from 4mm to 8mm wide. Please specify your choice of width into the comments box at check out. All our zirconium rings make great wedding rings for men, the advantageous reason being that zirconium is scratch resistant. In fact, the surface is so hard that what can appear to be a scratch is the surface of another object that has come into contact with the black zirconium surface. This surface is removable. Width(s) Available: 4mm to 8mm.